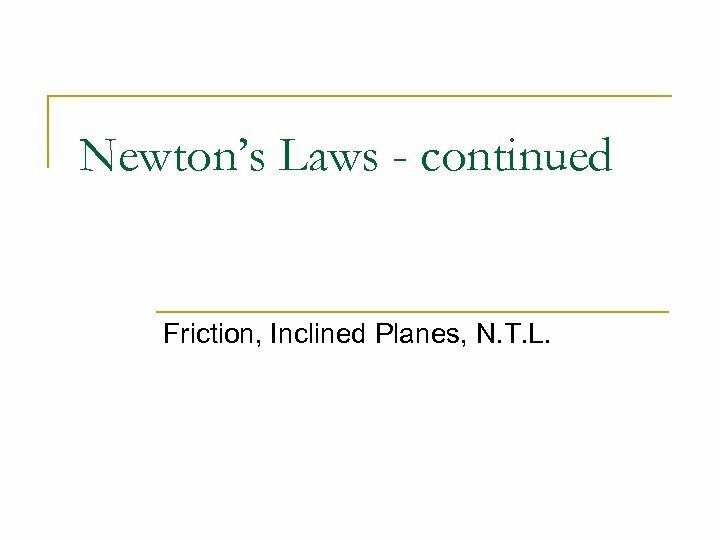 Newton’s Laws - continued Friction, Inclined Planes, N. T. L.
Force of Friction n The Force of Friction is directly related to the Force Normal. 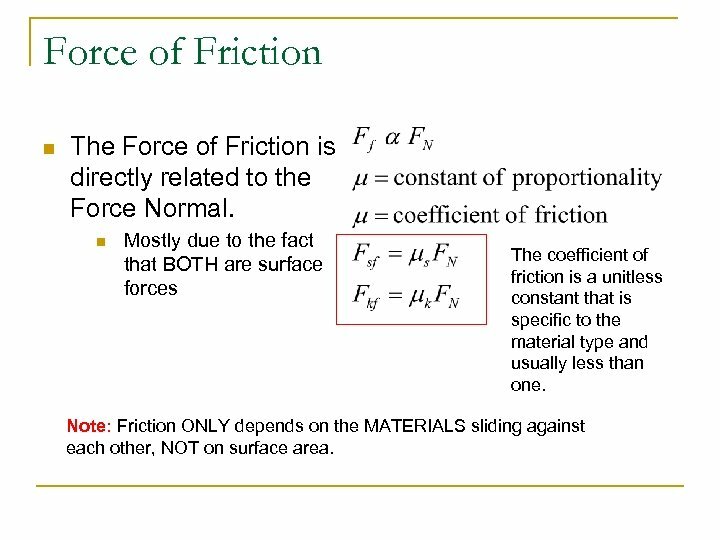 n Mostly due to the fact that BOTH are surface forces The coefficient of friction is a unitless constant that is specific to the material type and usually less than one. 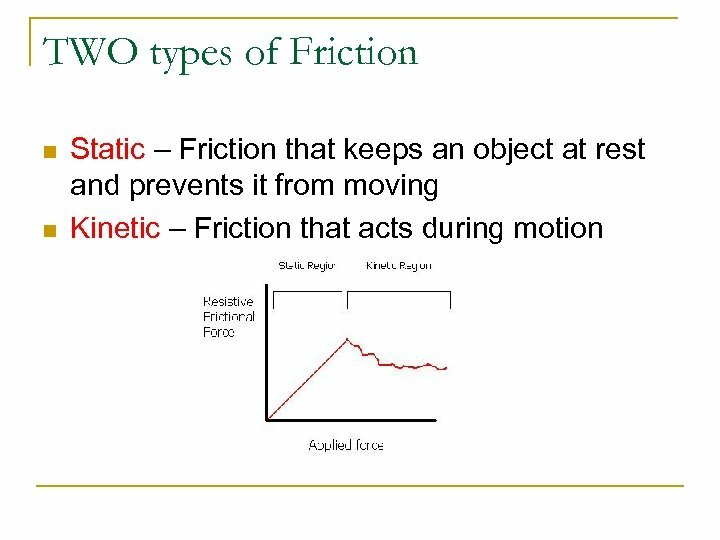 Note: Friction ONLY depends on the MATERIALS sliding against each other, NOT on surface area. 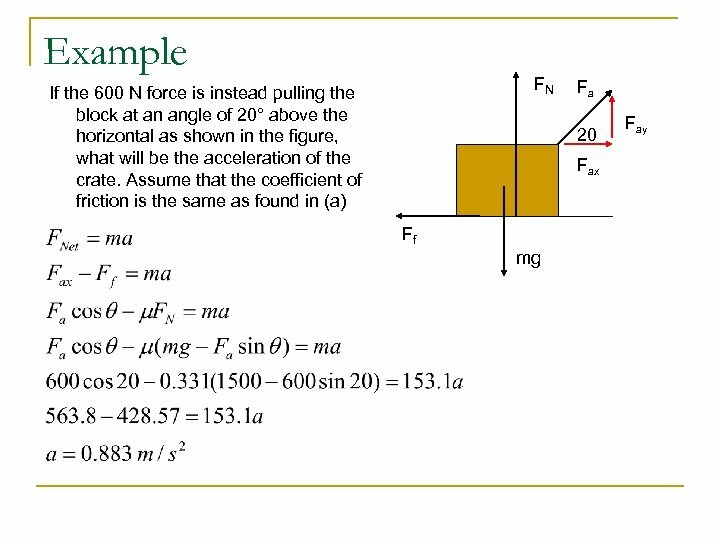 Example A 1500 N crate is being pushed across a level floor at a constant speed by a force F of 600 N at an angle of 20° below the horizontal as shown in the figure. 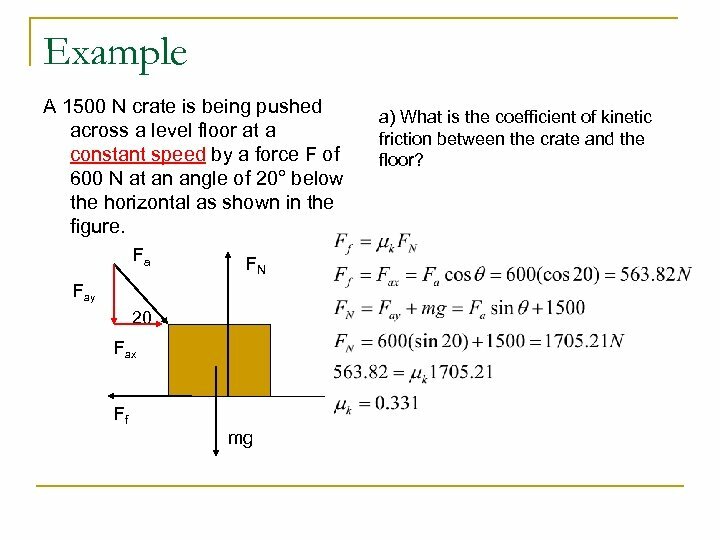 Fa FN Fay 20 Fax Ff mg a) What is the coefficient of kinetic friction between the crate and the floor? 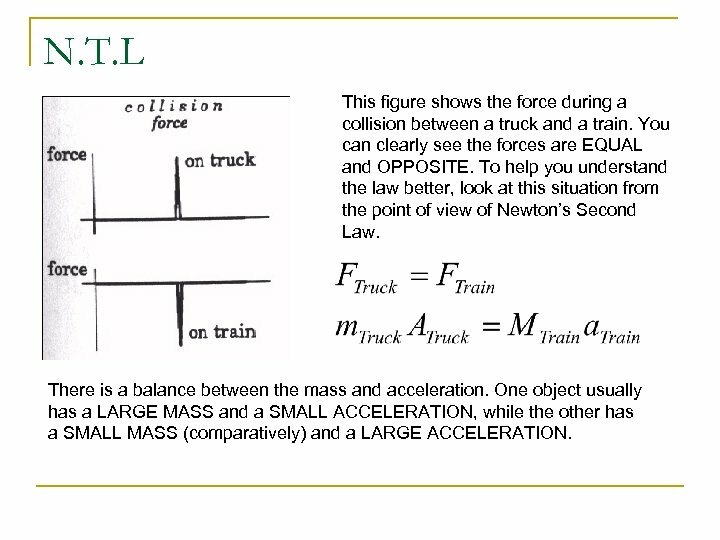 N. T. L This figure shows the force during a collision between a truck and a train. 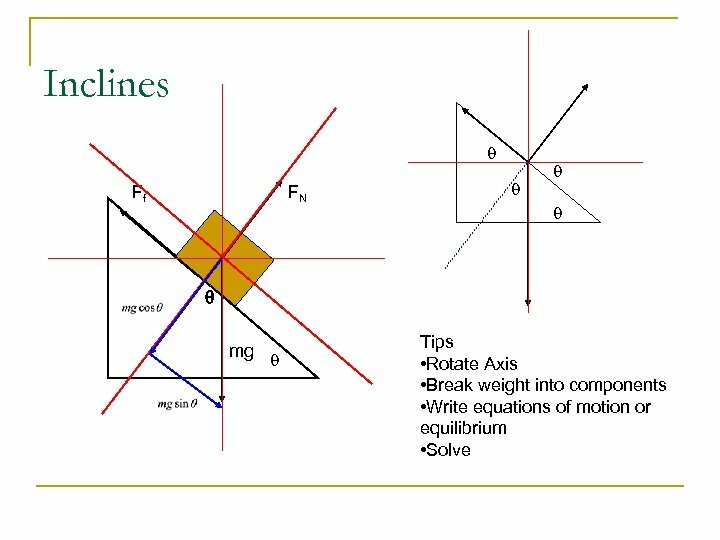 You can clearly see the forces are EQUAL and OPPOSITE. 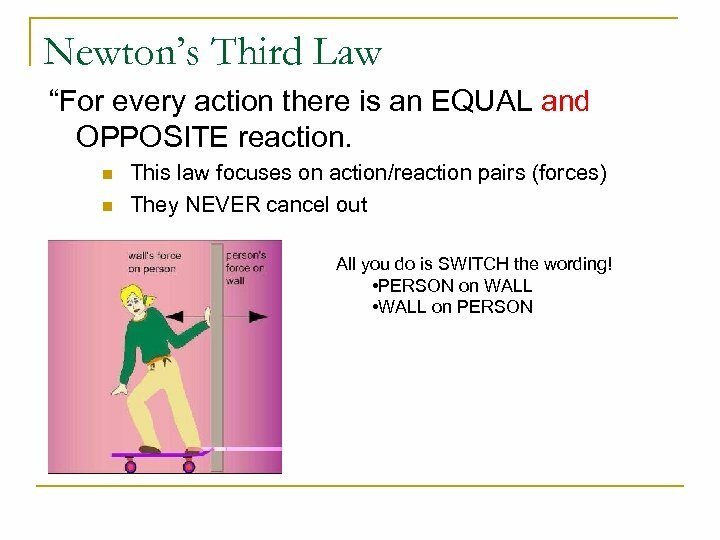 To help you understand the law better, look at this situation from the point of view of Newton’s Second Law. 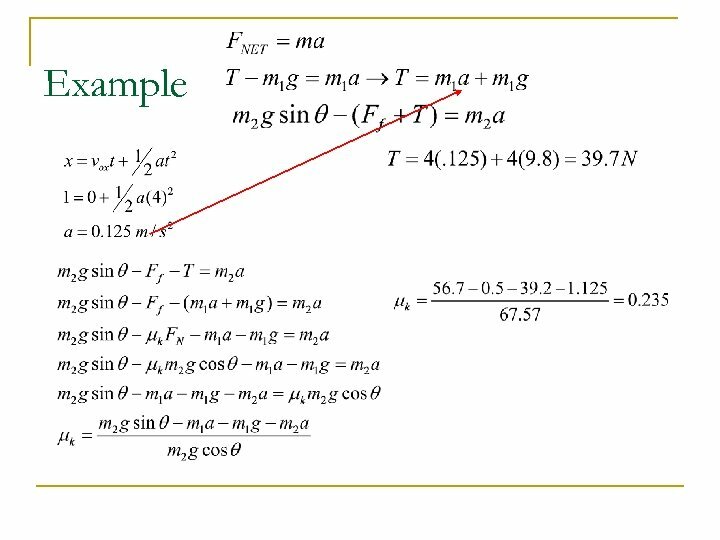 There is a balance between the mass and acceleration. 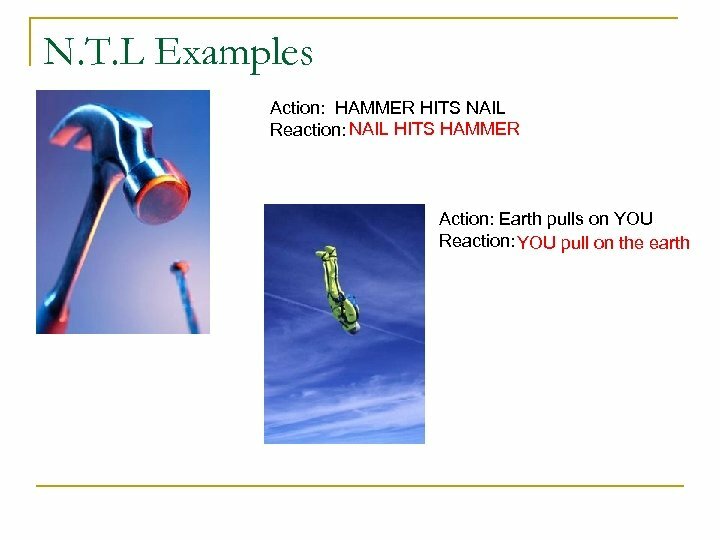 One object usually has a LARGE MASS and a SMALL ACCELERATION, while the other has a SMALL MASS (comparatively) and a LARGE ACCELERATION. What does this graph look like? Theta Force 1 11. 7536 10 11. 8579 20 12. 3351 30 13. 2728 40 14. 8531 50 17. 4629 60 21. 9961 70 30. 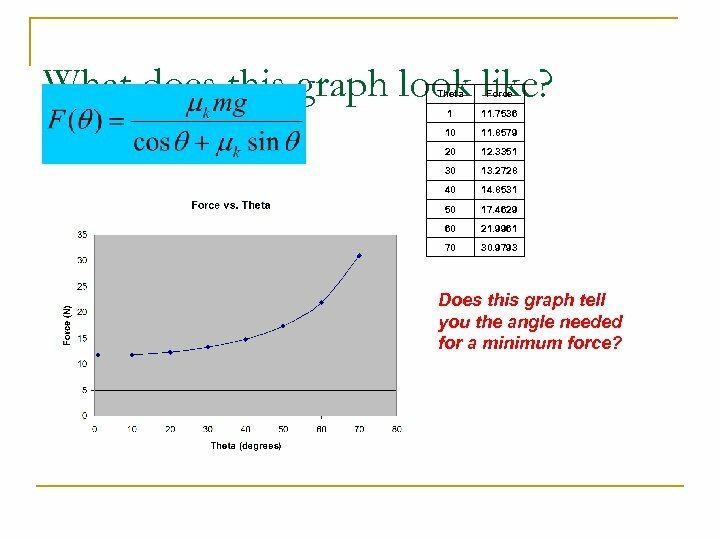 9793 Does this graph tell you the angle needed for a minimum force? What does this graph look like? theta Force 0. 5 11. 7563 1 11. 7536 1. 5 11. 7517 2 11. 7508 2. 5 11. 7507 3 11. 7515 3. 5 11. 7532 4 11. 7558 4. 5 11. 7593 5 11. 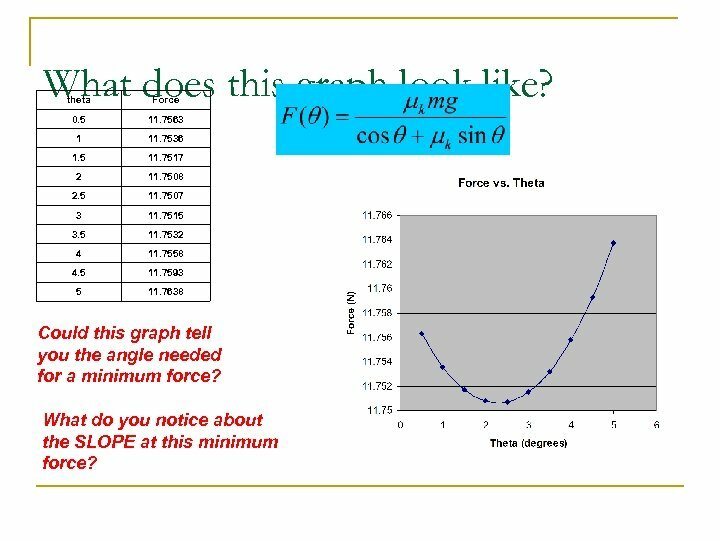 7638 Could this graph tell you the angle needed for a minimum force? 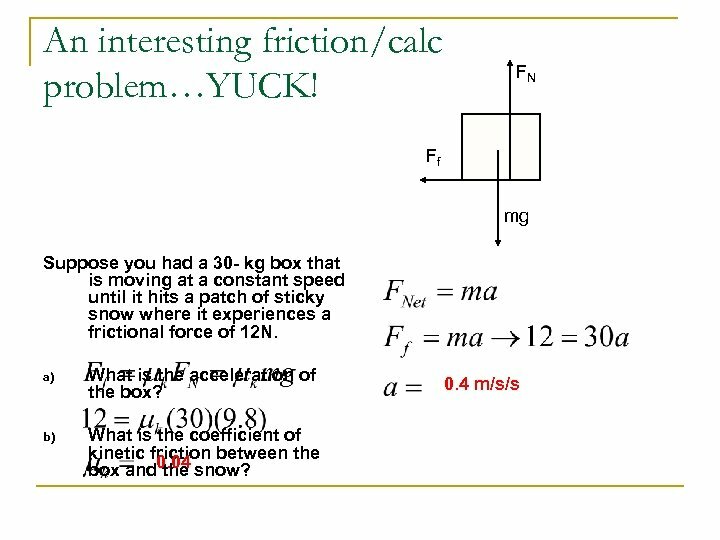 What do you notice about the SLOPE at this minimum force? 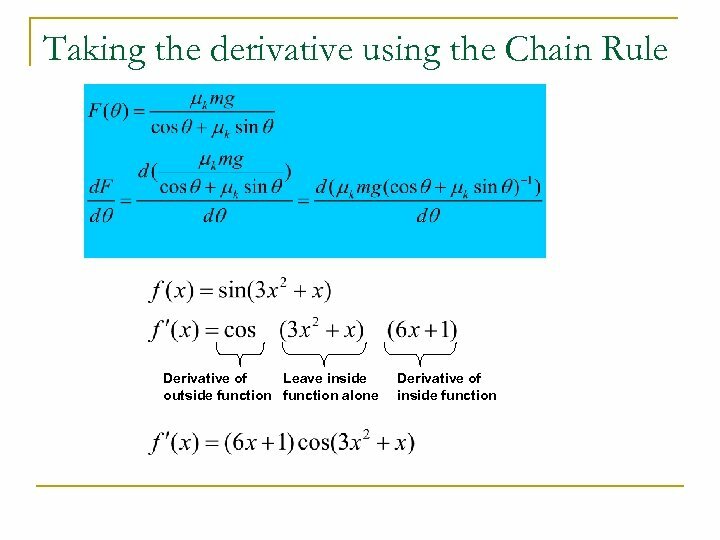 Taking the derivative Here is the point. 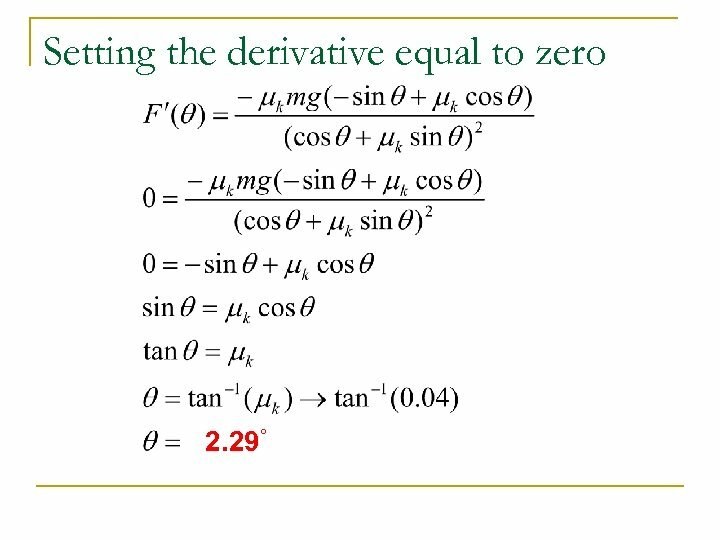 If we find the derivative of the function and set the derivative equal to ZERO, we can find the ANGLE at this minimum. 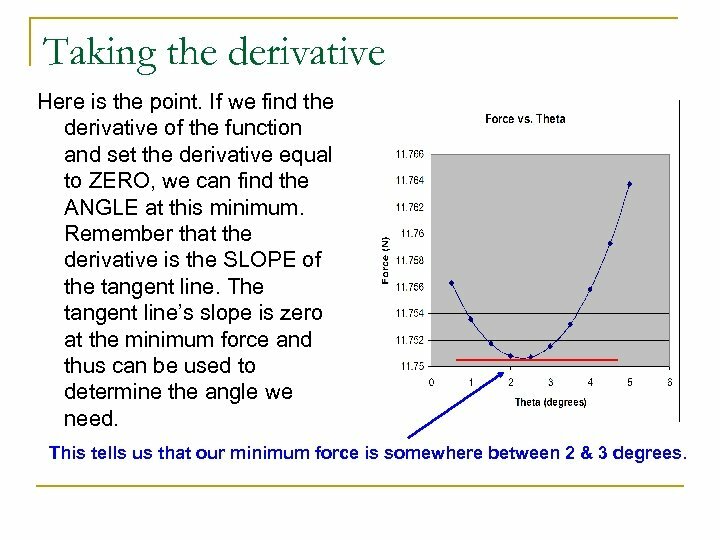 Remember that the derivative is the SLOPE of the tangent line. 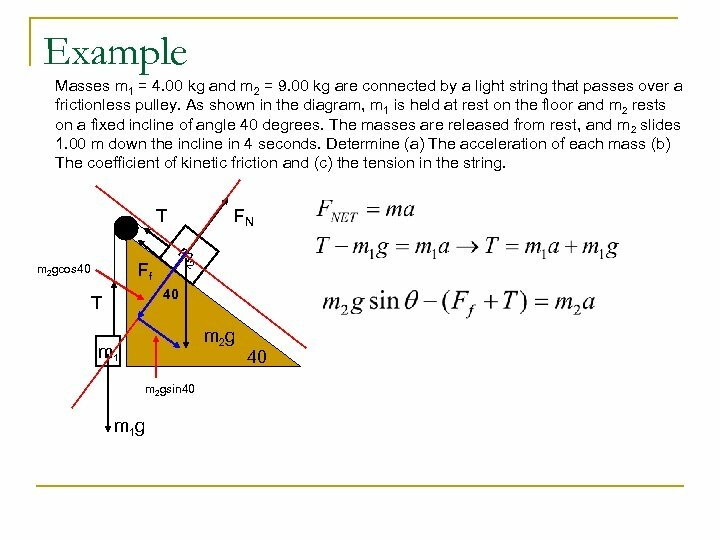 The tangent line’s slope is zero at the minimum force and thus can be used to determine the angle we need. 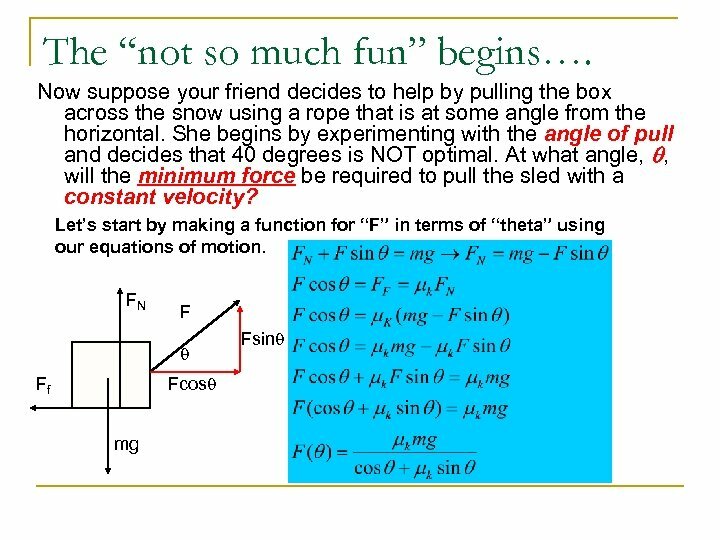 This tells us that our minimum force is somewhere between 2 & 3 degrees. 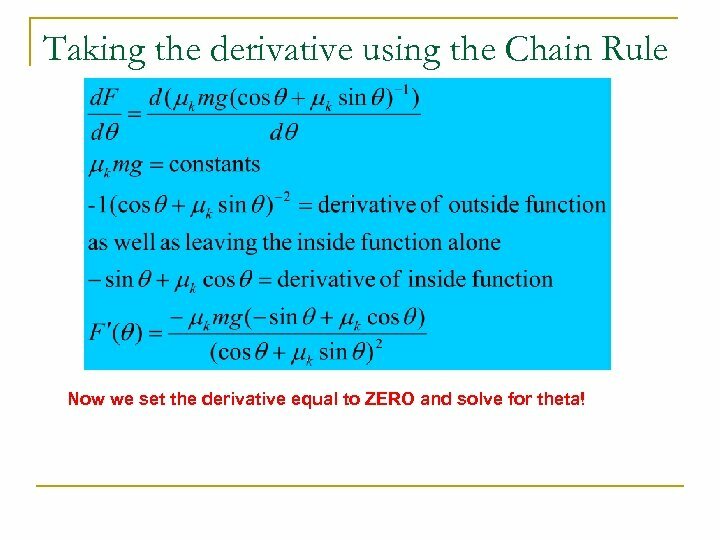 Taking the derivative using the Chain Rule Now we set the derivative equal to ZERO and solve for theta!